Myrna Gwinn, (nee Lurz) was born on September 9, 1938 to Margaret and Frederick Lurz, of New York City. She grew up in Pelham and West Hempstead, developing a life-long affection for books and animals, especially horses, dogs, and cats. The same month she earned a B.A. in English in 1960 from Marymount College, she was joined in marriage to (the late) Dr. Neil Preston Gwinn (originally from Albany), who met while working in summer stock for Westbury Music Fair. Their marriage was presided over by the (late) Monsignor Charles Vechinni, the bride’s uncle. They lived in Smithtown with their 5 children. Myrna earned a Master’s in Library Science from C.W. Post, and was employed as a High School Librarian in Amityville. Neil worked as a Guidance Counselor at Smithtown H.S. East, after first earning a B.S. in Biology (Sienna College) and a Doctorate in Psychology (St. John’s University). The family was known for Myrna’s kindness, as she always had a casserole for a friend or neighbor in need, and Neil’s unusual gardening attire as he tended to mom’s tea roses, as well as for their menagerie of pets. Myrna and Neil moved to Ten Hills, Maryland in retirement, to reside closer to their adult children and grand-children. Neil passed away in 2003. Myrna eventually moved to Leesburg, Virginia. 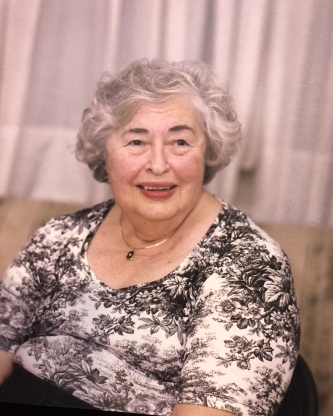 She lived her final days in the loving care of Capital Caring Hospice and Loudoun Nursing and Rehabilitation Center, where she died on March 22. Myrna and Neil left behind so many beloved friends and family, who will one day reunite with them in our heavenly kingdom. Among the bereaved are Laura (David) Balcom, Carol Brill, Neil (Alice) Gwinn, Linda (Timothy) Casey, Claire (Stephen) De Angioletti. Also surviving are grand-children Sam, Emma, Jacob, Christopher, Adam, Ethan, Megan, Daniel, Dylan, Jenna, Annabelle, Shannon, Brendan, Julie, Kelly, Ryan, and great-grandsons Malachai and Isaac. The couple is survived by a host of life-long friends who mourn their loss. Myrna and Neil leave behind a legacy of love for the arts, musical theatre, sea shells and the beach, and literature. A wake will be held on Tuesday, March 26 from 5-8 PM at Hubbard Funeral Home (Baltimore). A funeral mass will be on Wednesday, March 27 at 11 AM at St. Joseph’s Monastery (Baltimore). In lieu of flowers, donations may be made to Home-Delivered Meals Program (Loudoun County Parks and Recreation/Area Agency on Aging).